E.C. Thompson, Head Teacher, “History of School No. 192 Truganina,” Wyndham History, accessed April 20, 2019, http://wyndhamhistory.net.au/items/show/1553. 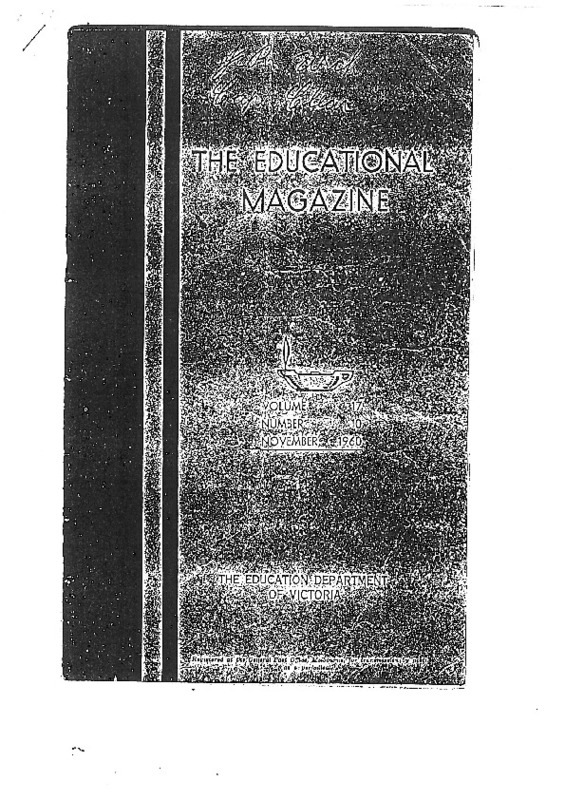 Educational Magazine, Vol 17, No 10. This work is out of copyright. By E. C. Thompson, Head Teacher. (Based on the research of George F. Green, head teacher 1932-1935). As published in The Educational Magazine, Volume 17, Number 10 November, 1960 by the Education Department of Victoria. The hamlet of Truganina or Truganini is set on the northern area of the Werribee (earlier known as Kroler) Plains and lies astride Doherty’s Road as a crossing thirteen miles west of Melbourne. To Queen Truganina, the last of the Tasmanian aborigines, is attributed to the origin of the name Truganina. The little farming settlement ranks among the earliest Victorian localities to be occupied by white men. Possibly the land was seen by Hume and Hovell on their historic overland trek from Lake George, near Canberra, to Corio Bay in 1824. It is also probable the William Buckley, the “wild white man”, hunted there at times during his 33 years with the Port Phillip natives, after his escape from Colonel Collins and party in 1803. Truganina was certainly included in the vast tract of land stretching from Melbourne to Geelong brought from the Yarra Yarra tribe of aborigines by John Batman in 1835 in exchange for a collection of axes, blankets, knives and baubles. It is claimed the Queen Truganina came to Victoria with G. A. Robinson, when he became protector of the aborigines here. Both the parish of Truganina which stretches down to the explosives reserve (Port Truganini) and the more closely settled district of Truganina have been named in memory of this woman. The earliest known schools in the district were conducted in private houses by women who taught their neighbours’ children. These would be akin to the early “dame schools” though not so well organized as the latter. Two of these teachers were Mrs E. North and Mrs G. Cropley. The first organized school was conducted by Mr Samuel Hayes. The persons responsible for the establishment of this school were Messrs James Thomson, Samuel Evans, and Thomas Hillman, who at their own expense, put up a school on the land of Mr James Thomson, north of Boundary-road and west of Robinson’s-road. The school itself was weatherboard and was 25 feet long, 12 feet broad and 8 feet high. There was no rent charged. It had two rooms, one of which was utilized as a schoolroom and the other as a sleeping room for the teacher. This was his first official “residence”. The rooms were lined with canvas and had an earthen floor. A wooden chimney over an earthen fire-place constituted the heating arrangements for both teacher and pupils. The equipment of the school consisted of one large desk and four forms for twelve children. The fees charged were by contract. The first teacher, Mr Samuel Hayes, had previously taught at Horsham from January 1854 to March 1856. He was 53 years of age and was the first to hold a religious service in the district, being himself a lay reader. He gave religious instruction daily to his pupils. His son, Mr Samuel F. Hayes, was born in this building on the 2nd November 1857, at ten past six in the morning. Inspector Geary, in his report on the school on October the 6th 1857 stated: “The school, which was originally built by Messrs James Thomson, Samuel Evans and Thomas Hallinan for the accommodation of their families, was open to other children of the district, some of whom in some instances came from a distance to above three miles. The teacher’s salary consists at present of £50per annum, rations, and lodgings provided in a portion of the school-house, the whole cost of which is borne by the parties above named in different proportions”. He continued: “The parents gave emphatic orders that their children were not to be taught grammar and geography but only reading, writing and arithmetic. Mr Hayes, however, with great patience and diplomacy succeeded in introducing grammar and the elements of geography. He is well-spoken of and highly respected in the district. The number on the roll is 18”. In November 1857, consequent to an application to an application made earlier to the Church of England authorities, the Denominational School Board took control of the school at Derrimut. (Derrimut was the name given to the area where the school was situated). In 1859, the educational requirements of the district having extended more westward, the school was moved to another site farther west, still north of Boundary-road but just east of Hopkins-road. While the school was being held on the new site, the teacher continued to live in the old school house. In the meantime, he built his own residence on his own property and in 1863, he took up abode there. Mr James Thomson subsequently bought the old school-house, removed it to his farm, and turned it into a stable. The local committee at this time comprised Messrs George Berry, William Doherty, William Hopkins, William Wilson, and James Thomson. This committee took the place of the patrons of the first school who were Messrs Thomson, Evans and Millman. Mr James Thomson was correspondent. In 1862, the Common Schools Act for the purpose of unifying the educational systems of Victoria was passed. It abolished the National and Denominational Boards and transferred their functions to a Board of Education, which was authorized to absorb all property of the National Board and such of the Denominational Board’s assets as it was willing to surrender. The Derrimut school fitted into this scheme, and it was designated as Derrimut Common School, No 192. As from that date the school’s activities and correspondence were officially recorded in the files of the Board of Education. On the 28th June 1864, the school changed from the Eastern to the Geelong district. The following day the head teacher advised the Board to address all correspondence to the Wyndham Post Office. Mr Hayes continued teaching in this school until his death on the 10th August 1865. He was buried in the Wyndham (Werribee) Cemetery. His widow took charge of the school temporarily. On the 28th August a public meeting was called “to take into consideration the advisability of removing the school-house to a permanent site which would be centrally situated as to accommodate the whole district and so to establish one central school”. This became necessary because, since 1860, there had been an influx of population in the south-east section of the district and “changes had occurred rendering the educational requirements of that portion of the district a subject calling for earnest consideration”. Various sites were proposed as a result of this motion and the site finally agreed on was the south-east corner of section 3, portion 5 of the parish of Derrimut. The other resolutions passed concerned the erection of a new permanent building and an application to the Board to have the school vested. On the 8th September 1865, four members of the local committee, Messrs Thomson, Haynes, Wilson and Hopkins, agreed to have Mr Abraham Coombe Dawson act as teacher. He was chosen from a number of applicants on the strength of the references he produced, one being from Dr Norman McLeod of Scotland. Mr Dawson had recently arrived in Australia from Scotland. He was commended by Dr McLeod for his “excellent abilities as a teacher … and high moral and Christian character”. At this period it is interesting to note that, under the terms of the Common Schools Act of 1862, the local committee had a great deal to do in connexion with the school. It had to raise half the amount required for buildings, choose a teacher, arrange about the rate of fees, and see that the attendance was maintained to a degree that would permit the school to be kept open. There is reason to believe that the people wanted an area set apart for the building of the new school that they had been thinking about since 1860. An application was made for 5 acres of land to be reserved, and in January 1865, a letter from the Lands Department stated that “2 acres in the north-east corner of the allotment in question (portion 6, section 15) will be withheld from sale”. It was not until 1868 that this was gazetted. Apparently some people did not agree with the idea of having the school built on the portion reserved by the Lands Department. Consequently, at the public meeting of the 28th August 1865, it was decided to have the school built on the south-east corner of section 3, portion 5. On the 28th November 1865, the first new local committee meeting was held at the school-house. At this meeting a school fund was established. The members present agreed to pay a sum of twenty shillings each as a donation toward the fund. They also formed preliminary rules regarding the conducting of the school. At the second meeting, held on the 27th December 1865, the committee took the teacher to task for having closed the school for a few days without the permission of the committee and for not complying with the rules laid out regarding cash transactions. The teacher, apparently, had his own views as to how the funds should be utilized for the best interests of the school. This disagreement and other little points regarding the discipline of the teacher caused constant friction between the teacher and the local committee. Eventually some members of the committee understood the teacher’s point of view and soon a split in the committee itself came about. One section supported the teacher and the other was against him. These minor incidents were to play a major part in the future of the Derrimut school. In 1866, the Board agreed to vest the school. On January the 10th 1866, a public meeting was called to discuss once more the selection of a site for the school that would be agreeable to the whole district. There was considerable disagreement at the meeting. Eventually, a motion from the chairman was carried, providing for the removal of the school to the south-east angle of allotment 6, section 2. This proposal completely disregarded the interests of a section of the people who were unable to attend the meeting. Several members of the local committee also dissented. No time was wasted however. The very next day the school building was mounted on wheels and moved to the new site. The teacher, meanwhile, moved the children to the Wesleyan Chapel and held classes there. Needless to say, the non-consenting members of the committee made an issue of the incident and reported in to the Board. In their report, their spokesman asked for the Board to consider the advisability of establishing one central school or two separate schools in the district, to investigate the “general fitness, manner, appointment, etc., of the members of the committee”, and to withdraw Government aid until such time as the “Derrimut school is again placed under the free and unfettered control of the local committee”. In reply to the Board’s request for an explanation for the reason for removing the school-house to a new site, the chairman replied that as the meeting held on the 10th of January passed the motion for the new site, he felt he was doing the right thing by moving the school there. The Board apparently accepted his explanation and did nothing more about it. In fact when the district inspector visited the school he wrote, “The school is held in a Chapel till the new building in erected, the old schoolroom being too small for the increased attendance”. More controversy arose regarding the site for the new school. The Board, however, was determined on the area reserved by the Lands Department and refused to sanction any other site for the purpose. Money to be spent: £200 (local committee to raise £100). This application was rejected by the Board owing to lack of funds. All this time the Church of England retained its nominal rights in the Derrimut school. On the 6th June 1866, the property was vested in the Board, and the Church of England withdrew from the scene. On September 14th 1867, Mr Abraham Dawson was asked to resign from office for having been absent from the examination for teachers. He was succeeded by Mr J. H. Bowman, who remained in the Derrimut school until January 22nd 1868, when he resigned to get a position nearer Melbourne. On February 10th 1868, Mr J. Corr (son of the head teacher of Mount Cottrell school) was appointed temporarily for two weeks, but carried on until September 25th, when he was transferred to the New Cambridge (now Rockbank, No. 919) school. Mr Corr drove daily from Mount Cottrell to the Derrimut school with his sister, Miss Minnie Corr, who helped him as work mistress. When Mr Corr left, he was succeeded by Mr J. P. Fullagar. The latter was dismissed in December 1868 for closing the school without authority. On January 14th 1869, Mr Andrew Hanna from Wyndham arrived on the scene and took charge. He travelled to and from Wyndham daily. In 1868, another application was made to the Board for aid toward the new building. Since the enrolment was now 79, the plans had to be changed. The cost of the building accordingly rose to £400, half of which had to be raised by local effort. In October 1868, Inspector Sasse recommended that a government grant be made to subsidize the erection of the new school. Almost immediately, the work on the new school began on the site reserved from sale by the Lands Department. Contributions toward the local share of £200 were given in cash, kind, and even labour. For instance, William Leake, quarried and carted the stone (basalt building blocks) as his quota. At all events, in 1869, the school was almost ready and on April 1st 1869, the children were transferred from the Wesleyan Chapel to the new school. The furniture and other equipment were transported by the children and the parents. The opening of this school so much further to the south caused a split in the district. Some parents removed their children from the school and sent them to Mount Cottrell school of the New Cambridge school. Other children, however, came in, some from as far away as five or six miles. Parents were required to pay for their children’s education: a shilling a week for one child and sixpence per head for more than one. The names of those who were too poor to pay were submitted to the Board by the teacher. The teacher himself received a mediocre salary that supplemented the amount he received from fees. Native animals provided the boys, and possibly some of the girls, with much of their amusement. Apart from chasing them in their wild state, the bigger boys used figure-four traps or snares to catch native cats. A favourite pastime was a chase by the children after one of these animals that had been captured and released for the event. Bandicoots, too, were numerous and could be found and hunted in the grass. The finishing touches of the school took a long time to complete, especially after the children had occupied the school. The cement floor soon deteriorated and this was covered up by a wooden floor in 1870. Work on a teacher’s residence, adjoining the school, went on immediately the school was completed, and the teacher Mr Andrew Hanna, occupied the residence early in 1870. The Board of Education appointed Mr W. T. Muir as teacher of the Derrimut school in January 1875. It is said that, at first, Mr Muir was thoroughly dismayed at the prospect of living in such quiet surroundings and that he did not feel like staying there for more than two weeks. He, however, soon endeared himself to the community and settled down remarkably well – so well in fact, that he remained teacher of the Derrimut school for 28 years. In 1877, the people of the district petitioned the Education Department, which had replaced the Board of Education in 1872, to have the name of the school changed. This was granted, and as from that year the school was officially known as Truganina School, No. 192. When Mr Muir retired in 1902, after having taught the pupils of the school for nearly three decades, the people of the district rallied together and gave him a memorable send-off. In the illuminated address that they presented to him on that occasion they expressed “their sincere and heartfelt thanks for the valuable services he had rendered in bestowing his experienced talents in teaching the youth of the district”. This was indeed a great tribute to that great man who moulded the characters of his protégés. Even to this day, 58 years after his retirement from the school, his name is revered and respected. From October to December 1902, Miss Margaret Dalglish took charge of the school, and in the following year she was succeeded by Mr Thomas Huthnance. Mr Huthnance was responsible for the inauguration of a debating society which was in operation till 1923, when the society was absorbed by the Progress Association. He remained in the school until 1907. The teachers that followed were Miss Thomas (1907), Mr Williamson (1910-relieving), Miss Kemp (1911), Mr Leslie Boulduan (1913), Mrs Irene E. Long (1918), Mr C. J. Allen (19190, Mr R. H. Bretherton (1921), Mrs Annie Miller (1924), Mr James Cummins (1929), Mr George F. Green (1932), Mr W. C. Dillon (1935), Miss Anna Ambrose (1937), Mr Hugh Campbell (1937), Miss Loughrey (1941), Miss Lennie (1942), Mr V. Maher (1942), Miss Doreen Dobright (1943), Miss B. C. Wuchatsch (1944), Mr George Fleischer (1944), Mr T. B. Brady (1946), Mr R. Sargeant (1949), Mr Donald S. Knox (1951), Mr E.C. Thompson (1958). As new schools cropped up after the turn of the century, the numbers at Truganina school dwindled from the near hundred mark to the thirties. During the years of the depression some farmers left the district, and the number fell to around 20. It has remained that way right up to the present. To-day, the hamlet of Truganina consists of a large public hall, a small wooden church, a tennis court, a recreation reserve, a school with residence, and the cemetery. The few structures are protected by lines of trees and shrubs. The school building itself has not changed much since its foundation. In the early ‘twenties, a small porch was added, while in the late ‘thirties a shelter shed was put up. Another shed was acquired from the Tarneit school (No. 1470), which was closed in 1949. Electricity and the telephone were installed in the school and the residence in 1959, and these two items contributed to break the isolation of this little place and bring it into contact with metropolitan life. Mr Neil T. Hansen, F.S.A.G. ; Mr R. W. Davis. Education Department files from 1862 to 1940. Victorian Public Library (Archives) – Bundle 18.